3 Activities To Do Before Your Child Takes Their First Steps, Plus Noah Cruising On The Gait Trainer! You are here: Home / Therapy / 3 Activities To Do Before Your Child Takes Their First Steps, Plus Noah Cruising On The Gait Trainer! 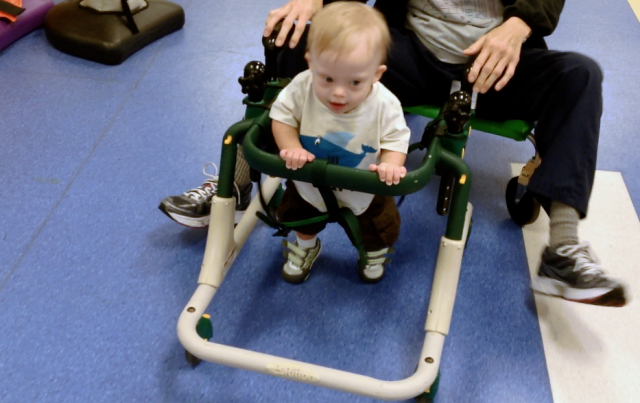 Noah took his first steps on the gait trainer back in December. Do you remember how slow and timid he was? Things have definitely changed with that. He is a speed racer today and knocking into things for fun (typical boy). We don’t use the gait trainer that frequently, but we have come back to it as Noah is getting closer to walking on his own! Look at those little feet go! When we first started, Noah was barely putting weight on his legs and had just learned to pull to stand. Currently at this stage he is walking when holding two hands and is cruising with two hands on furniture. Per Patricia Winders, you should start using a push toy when your child can step well with two-hand support. I wouldn’t necessarily say Noah steps well… He leads with his head followed by his belly which is a nice recipe to fall flat on your face. I think it may be that he is so excited to get to his new location he flings himself forward (can’t you tell by the expression on his face in the video when he breaks free?) He’s definitely an explorer! This little boy is an explorer! Here are a few activities anyone can do at home (for free!) with their child before they start taking their first steps. These exercises can easily be worked into things your child is probably already doing (or trying) to do as they play around your house. We have been working on a few things to help Noah prepare to walk. We are wanting him to play in standing as well as stand with his back against a wall. When his back is to the wall we will have him reach for different things on either side. This helps develop strength in those muscles needed for walking including the rotation of the body that is needed for balance. We have also been letting him climb to work on core strength as well as building strength in extremity muscles needed for walking. Noah climbs up the stairs as if it is the best adventure in the house. He has also started climbing on things like our gates, toys, window sills, and furniture. As much as it gives me a heart attack how can you be mad when he attains such an awesome skill. It is also a skill we have not had to encourage much on our own, he gets into trouble all on his own. Noah loves to climb! The furniture is going to need to be attached to the wall for sure. Look at this little boy cruise! We also encourage him to cruise. He is sticking to the two hand approach right now, but we are trying to get him to hold our hand and then keep one hand on the item used for cruising. He is not as interested in this method of transportation right now. Looking back the one thing I wished I had worked on more was Noah’s quadricep strength. This kid won’t squat for anything. His lack of strength in this muscle has affected his balance most of all. He tries to stand with straight legs which may be the most difficult route he can come up with. When he sits down, he also keeps his legs straight for a giant plop. He has no interest in bending those knees. One way to work on this is to have them sit on a box that puts their legs at a 90 degree angle and practice standing up from that position, your leg (depending on your size) may be an excellent option as well. I firmly believe that once the kid figures out this he will be a walking pro. Anyone else have crazy climbers in their house? Any tips for keeping your kid safe? Has your child tried any of these pre-walking activities? Leave a comment below and tell us about it. 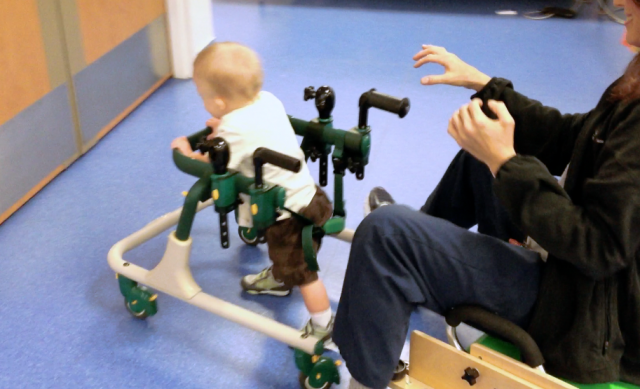 Rick…can you shoot me an email and let me know what facility offers the gait trainer for Noah? 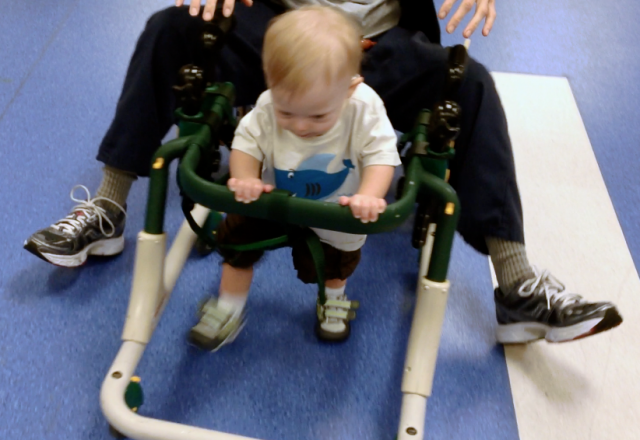 Little Bird is 6 months, and we want to start looking into this for him around 9 months …read a couple articles that showed that introducing the gait trainer between 9-12 months helped baby walk faster, etc. Do you think 9 months is too early? Thanks for a GREAT post on the topic of gait trainers!!!!! Hey, thanks for the comment. Noah goes to Our Children House at Baylor. If you use the search box on the right side of our site you’ll find lots of info about it. They are great. He’s been going there since he was 3 weeks old. Our grand daughter is ~6 months younger than Noah & just walking on her own. She also likes to dance like Noah – a delightful little girl. She has been signing for a long time & now speaking. We put a gate up blocking our steps, but she’s watching us open & close it. She will figure how to open it at some point. So we just ordered the stride to ride dino for my 16 month old Haddey. She is so wanting to walk and is holding my hands to walk were ever she can. She is getting to the point that she pushes our hands away so that she can do it on her own, then falling, so I think that our little red head( not to offend any red heads) will love having something that she can go to and do when she wants and doesn’t have to wait on anyone. And then then I can stand up right again, She is moving around couch and activity centers really well. I don’t like that she can pull everything down on top of herself, Dino seems sterdy for her, So thank you for the idea. Of to the races she goes. Thanks so much for your comment. I think she will really enjoy this push walker. Our son got ALOT of use out of his. Be sure to come back and leave another comment when she gets it and starts using it. I’d love to hear how it goes.